If you dreamed all life explore undersea world, but for some reasons could not, this trip is for you. Or if you can not swim, do not worry, you only need to seat oneself a motorbike, feel relax and enjoy the underwater world, watch and feed all the inhabitants of the ocean. You do not need special training, or special equipment. Our bikes are very easy to control. In motorcycles, you can breathe both on land because a motorcycle helmet is constantly supplied with air. Talk with your friend, because each motorcycle sits 2 persons. In the observation window you can look at the tropical fish. Motorcycles moving under the water in different directions, with speed of 7 km at a depth of 3-6 meters. Dive with the pontoon, near coral reefs where dwells has many tropical inhabitants in Tanjung Benoa. One of these places is called Batu Besar. If you translate Indonesian language it means Large Stone. At the bottom of the ocean is a huge coral in the form of a round stone. And just in this place, within the coral is located small underwater sculpture museum. All this makes the walk on motorcycles in this place even more interesting. Our company employs professional divers, who will follow your safety in the water. Our office is located near the sea in the area of ​​Tanjung Benoa, which concentrated all the companies that offer visitors of the island Bali all kinds fun activity in the water. Within one business day, we can cater for up to 30-40 people. For maximum safety of our guests we do dive only two bikes at the same time. Each bike is for 2 people. Briefing, signing international insurance it takes 5 minutes, after you can go on an unforgettable trip under the water of Indian Ocean. Visit our website and choose for yourself fun on the water. Always works for you for 24 hours phone support call +62 81237596410 or e-mail aquastarbali@gmail.com. 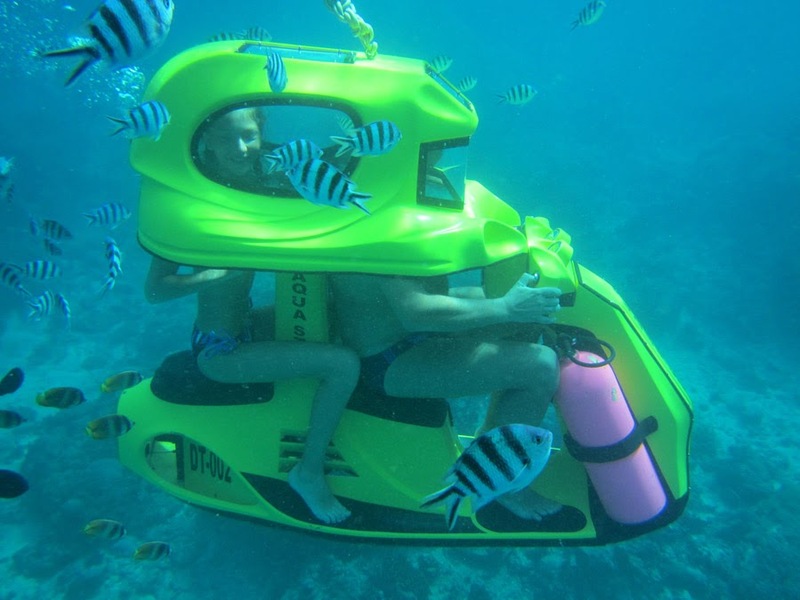 Your holiday in Bali will not be complete without a trip under the water motorcycles by Aqua Star. Get an unforgettable experience of exploring the underwater world of the Indian Ocean. Our company's mission is to give all people the opportunity to make a smaller distance between themselves and the ocean. We are always glad to see you in our company. Another underwater activities you can do is Snorkeling and the best spot is at Nusa Penida island. Why? this island offer very wide variety of underwater life, from Manta rays, the one and only "SUN FISH" in the world life on this island sea. How to get to this island? It's so easy, visit www.nusapenidaguru.com and choose the Nusa Penida Tour & Snorkeling Package. Still looking for idea on your in Bali Holidays ? do you have any reviews for this 21st things to do in Bali ? or suggestion for the next topic on Things to do in Bali ?